And because I’m always keen to offend as many of my blog readers as possible, as equally as possible, I believe it would be remiss of me not to mention that the Dalai Lama himself is believed to have unequivocally stated ‘F*ck Triathlons‘. And so it is that the cool cucumber whose embodiment I have enjoyed for the past few weeks has started to turn bad. Like one of those real-life cucumbers I buy on a whim at the supermarket, thinking I will chop it up and snack on fresh green sticks of vitality all week instead of chocolate, but which inevitably end up forgotten in the bottom of the vegetable crisper with one end slowly going soggy on the inside. I’m at that exact stage now: I look green and vital on the outside, but push a little harder and you will find that one end of me is complete mush underneath the healthy facade. The rot started slowly, when I went to pick up my race pack yesterday. I’d spent the morning enjoying a late buffet breakfast and a lie down to let the food settle, before having a midday ocean swim against the wind (which has not yet died down) and generally enjoying the buzz that is building here in Noosa. The excitement is tangible and it is a wonderful thing to be in the middle of. My race number has my name on it! Picking up my race number and tattoos, though, made everything feel a little bit too real. 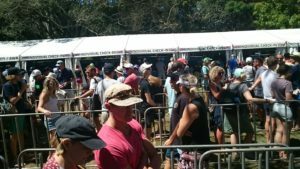 As I stood in the queue waiting to collect my bag full of swag yesterday, it was hard not to feel intimidated by the hundreds of people in front and behind me, all of whom seemed to be sporting t-shirts or baseball caps that heralded past achievements far worthier than my own ‘Race Straddie’ T-shirt, which I had selected with pride that morning but was quickly losing faith in. Shane had elected to stand somewhere over in the shade, so as I stood in line I had little to distract me from the comments I overheard here and there about people having ridden 3 hours that morning or swum 2 kilometres against the direction of the current as practice for Sunday. 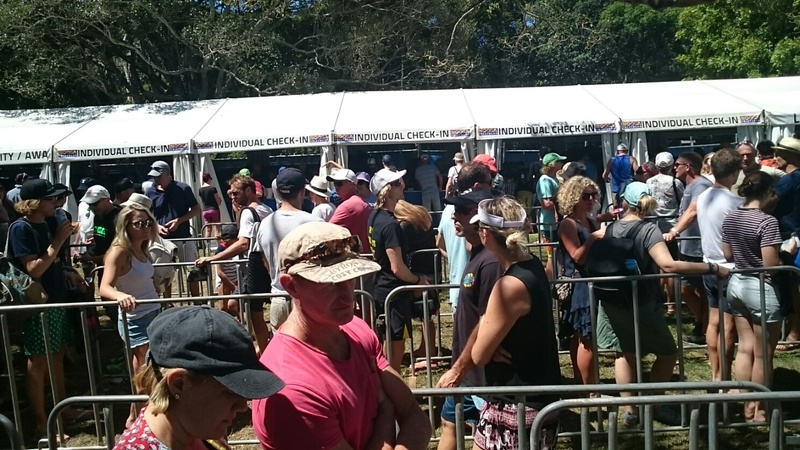 By the time I got to the front and the nice volunteers set about finding my packet, my emotions were running high. And when they finally handed over my swag and I spotted that my name was typed up underneath the number, it was all I could do not to burst into tears. 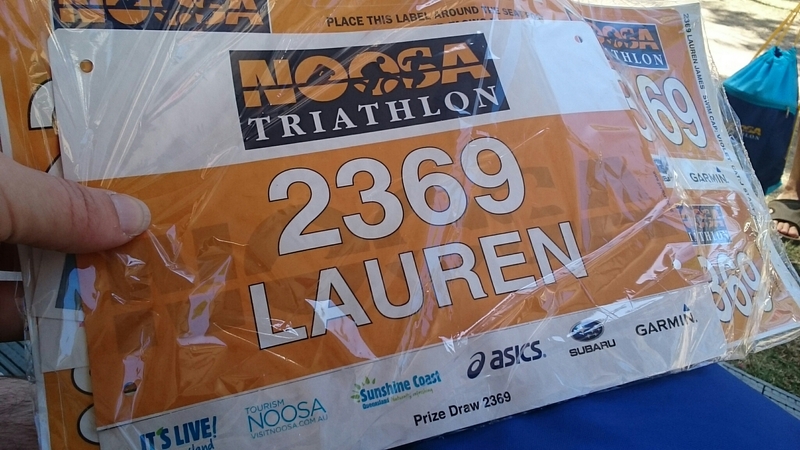 I’ve never had a race bib with my name on it before! And I am finding it hard to explain why this has affected me but I think it’s because I am really, really proud. And then at the same time as being really really proud, I am really, really nervous that I am going to let myself down. I am going to let my name down. Knowing me as well as he does (or perhaps being completely oblivious) Shane said nothing about my imminent breakdown but whisked me off for ice cream and coffee. Carb-loading, we called it, but really I think this was just comfort eating. And that’s OK too. 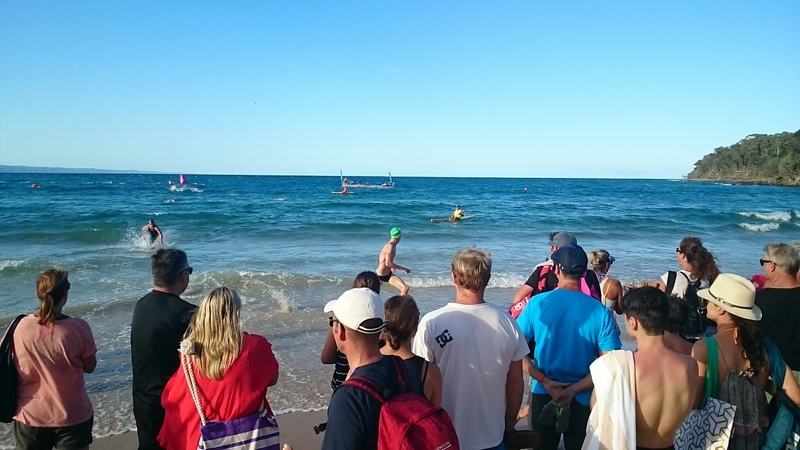 Then as the afternoon died down we headed over to the beach to watch the 1km ocean swim that was taking place. I was surprised by the huge number of people taking part, but it made for a great atmosphere and as always I was amazed and inspired by the super fast swimming. I was also very impressed to see my swimming coach Trent Grimsey (yes I can claim he is my coach, I’ve decided) take out his age group by a mile. Unfortunately, I once again managed to work myself up into an emotional frenzy as I imagined my own impending ocean swim and realised how terrible I am at swimming in comparison to every other person that has ever donned a triathlon suit. So we hung around for about an hour and then drifted away before I could poop my pants. Gradually then, the nerves are increasing and increasing. This morning I could feel it as I ate breakfast – usually a joyous occasion for me at any time, but never more than when I can legitimately ‘carb-load’ on four bowls of bircher muesli. Yes you read that right, four bowls. In my defence, they were small bowls. By the end of bowl number two, I was forcing the food down my throat in an attempt to ensure I was getting enough oats inside me. My stomach was starting to churn like a washing machine and it didn’t want any food at all. It was no fun. My mantra this afternoon is ‘cherish every moment’ and I am trying to remember that the nerves are all part of this adventure – that without them, this wouldn’t actually be an adventure at all. If it were easy I probably wouldn’t have bothered doing it. So this is what I signed up for and this is actually what I wanted. 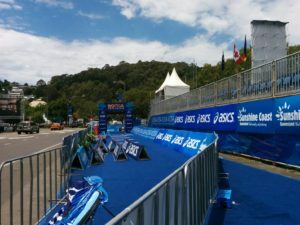 I just have to turn up at the start line in 12 hours’ time (it’s now 6.15pm) and trust that the training I have done will take me through the 50km I need to cover in order to make it to the finish line. I know I can do it, I just don’t know how much it will hurt or how long exactly it will take me. But if I can smile as I go, the hurt and the time wont matter. 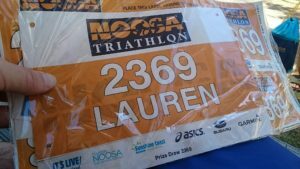 This entry was posted in Everything Else and tagged newbie, noosa, triathlon. Bookmark the permalink. Thank you Kelly, I am definitely going to channel you in the swim! I really hope my nerves fade after I start, but I think it might take until the end of the swim for the fun to set in if I am honest 😱 I look forward to updating you soon!